We are convinced that trade is most important for developing countries. Simple aid programs often lead to dependency and passivity. They prevent creativity and self responsibility. Dambisa Moyo describes this issue very well in her book “Dead Aid”. Visit the website of Dambisa Moyo. It is fundamental, that industrialized countries open their borders and let developing countries participate in economic growth. Africa shall not be used as simple and cheap supplier of raw materials. 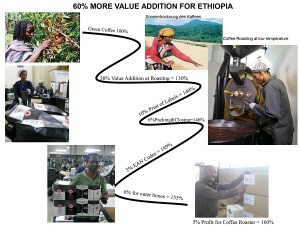 Only value addition and processing at the origin can ensure development. Only then qualified and better paid jobs are created. More information and FAQs about the Solino project are available here. This project was created in 2008. Please also meet the active Solino team and meet our employees. The coffee production process requires qualified labour. On a regular basis, Solino sends coffee experts from Germany to Ethiopia. 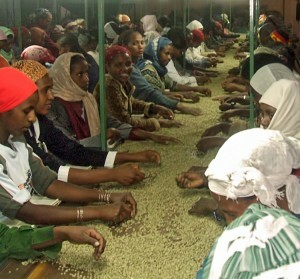 They train Ethiopian employees locally. If Ethiopia exported only roasted coffee (instead of green coffee), we estimate that 280.000 better paid jobs could be created. Here you can read about this in detail. We support the Ethiopian Initiative OurFathersKitchen, by donating for each container of Solino Coffee 1000 meals for street children in Addis Ababa. We like this initiative, because 100% of the donation is spend for the children. All employees work voluntarily and there are no administrative costs.